It’s cold in Valencia the day after Race One, threatening rain, windy and gray and gloomy. Time to go sailing. 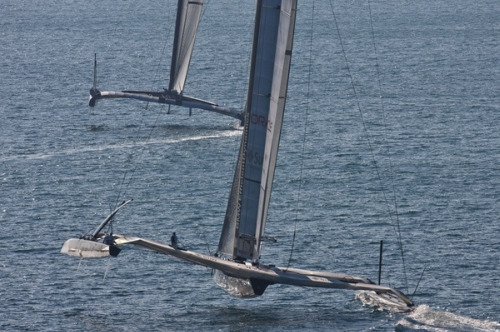 No, not the crew of the catamaran Alinghi 5, seen here, where “re-mode” would be the theme, perhaps with a tinge of desperation. I have no idea what’s going on in the pic below, which I shot in the morning chill. Nor will the crew of the trimaran USA sail today. If anything their focus on the layday is themed “reliability in race two.” Instead, the old ACC warhorses of 2007 are out on the waters beyond Malvarossa Beach, practicing for the Louis Vuitton Trophy Auckland just a few weeks away and pumped up with the prospect that a BMW Oracle Racing win at America’s Cup 33 returns Louis Vuitton to the America’s Cup future. Bruno Troublé has been looking very comfortable in the back offices of BOR this past week. He never wanted to lead Vuitton out of the Cup picture that he once led Vuitton into, but he and “Mr. Alinghi,” Ernesto Bertarelli, did not see eye to eye about how to conduct a challengers’ round, much less maintain a standard of sponsorship. But I suppose a word of caution is in order. I was on the water in 1983 when Dennis Conner went 3-1 against Australia II, and Gary Jobson turned to his companions and declared, “That settles it, the Cup stays here.” Those who know the rest of the story—Aussie II won the next three races straight, and the America’s Cup—will understand that it’s not time to declare a winner with one race done in a best-of-three in Valencia. 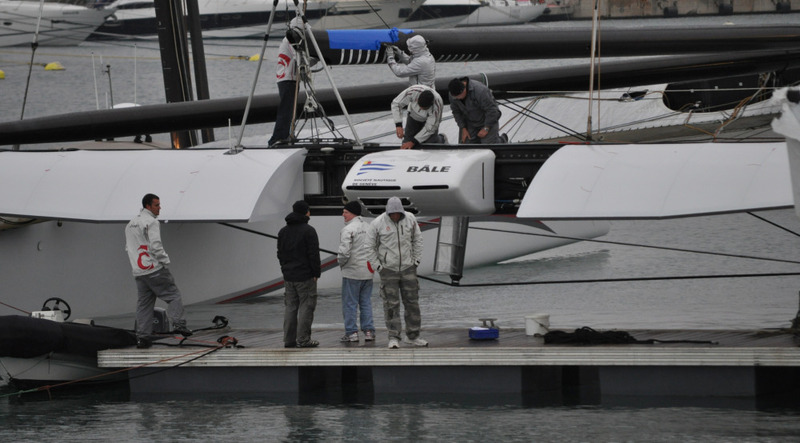 But if Alinghi is going to pull this out, they haven’t shown us what they’re going to use for the job. 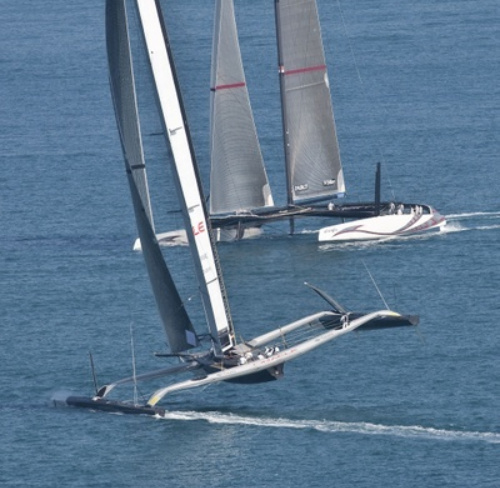 The wing-sailed USA trimaran was superior in Race One in everything that mattered and couldn’t be ruled out in those light winds that supposedly get the Alinghi team salivating. We didn’t get to see them line up steady in eight knots, but Alinghi 5 got away from the line more than a minute in front and could not hang onto that. The breeze was maybe edging out of single digits by the time USA caught up and passed. We were pacing alongside in a Protector brand RIB at 22 knots . . . 24 . . . 26 . . . and hanging on for dear life. I was right that the keenest view of the match would be onscreen, but I have no regrets about spending race one chasing in a RIB. When you’re a sailor, you want to be there. 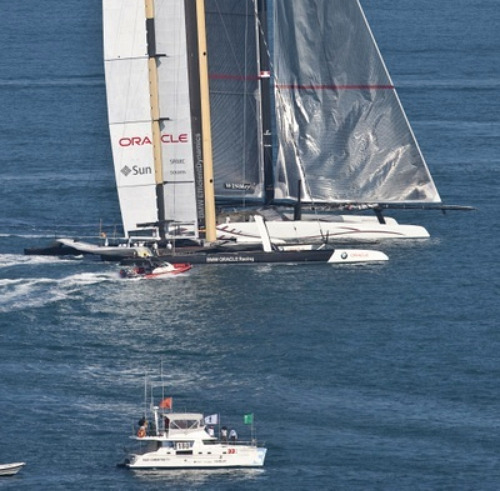 But it wasn’t until we were racing up the course, with USA trailing badly after its pre-start stall, that one of my companions confirmed via cell phone that Alinghi 5 was carrying a foul. Our view down the start line had shown two overlapping boats. We could hear some yelling. We could imagine, but not know. 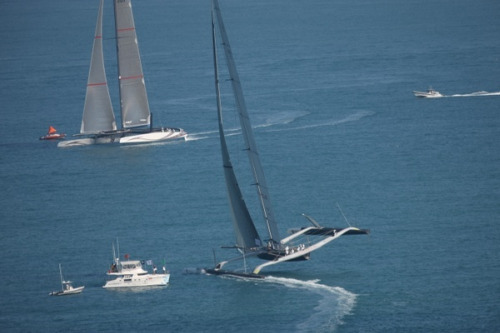 What was clear on the water, was how happy the trimaran was, compared to the Alinghi catamaran, in the shifting conditions and building breeze. The cat’s weather hull was up and down and up. The tri looked rock steady, though I’m sure that’s not how it felt, going higher and faster. 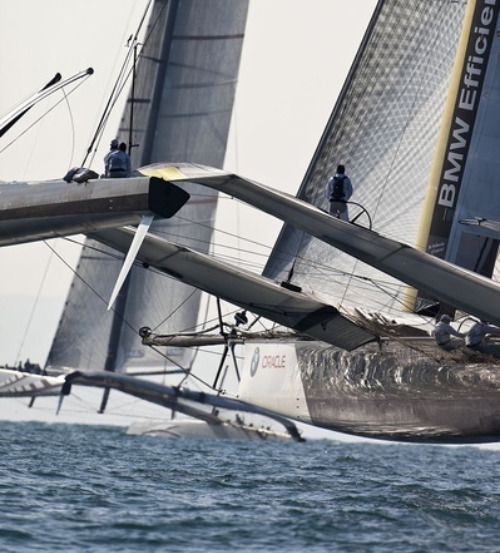 Alinghi 5 was carrying straight or nearly-straight boards, a light-air configuration, to USA‘s curved boards, which produce more lift. There were a few trade-offs between the two boats as shifts came through—Alinghi getting some private pressure for a moment and gaining, Alinghi losing gobs on a sail change, and so on—but there was only one trend line and it was all-USA. My 117 miles bashing around in a RIB are mostly forgotten in my bones—30 miles to the racecourse and 30 miles back, 40 miles plus chasing the race—but I see that the guys back home on the Bay Area Multihull Association (BAMA) forum are having some fun with the notion of these dinky monohulls chasing these grand multihulls. (“the chase boats were the only monohulls around; RC and observer boats seemed to be dominated by multihulls; perhaps time for an intervention?” or ” race committee boats will be all cigarette powerboats for next AC with even faster multihulls?”). Who knows. 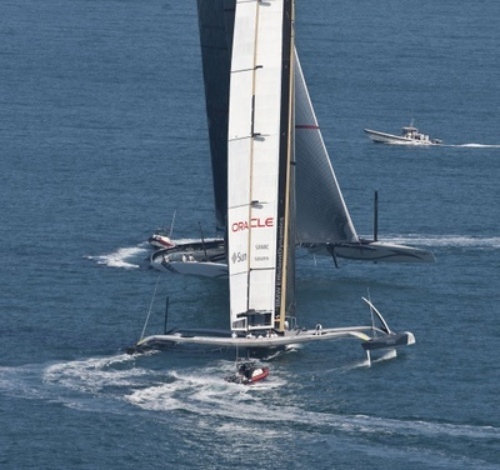 BMW Oracle Racing team owner Larry Ellison has said he wants to return the event to monohulls if he is able to take the America’s Cup in the name of the Golden Gate Yacht Club. In the spirit of waddling like a goose from rumor to rumor I’ll share the buzz of the hour that Artemis Racing might pop up as a Challenger of Record. Torbjorn Tornqvist’s Sweden-based team has been successful in TP 52 competition abd the like and is competing for the Maktoum Trophy now in Dubai with Paul Cayard skippering. You heard it here first (maybe) but danged if I know if it’s true. I do know that BOR team photogger Gilles Martin-Raget documented the race beautifully from a helicopter, and although I felt good about shooting it myself, I love this stuff. Let’s start with the start, not to be too tricky. Spithill and Russell Coutts both have been talking about mixing it up at the start. 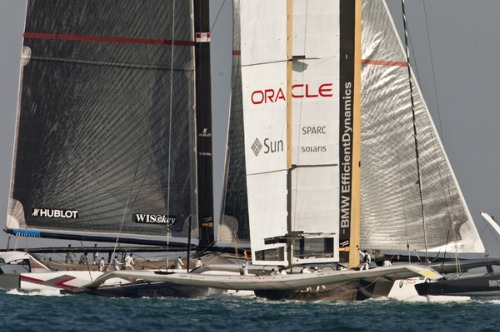 Alinghi tactician and team member Ed Baird always talked about how the port-entry boat would cross to leeward and then compete from the right-hand side of the box. They were warned. Is “Jessie James” Spithill looking aggressive on this entry or what? In the sights. USA has starboard-tack right of way . . . Engaged. 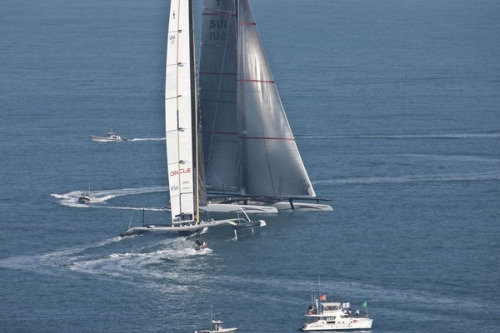 Alinghi must keep clear but can’t . . .
Nailed and flagged by the umpires . . .
USA, obligated to avoid a collision, turns into the dialup . . . The dialup, however, Spithill lost. USA kept making way, slipped in front, and stalled so that Alinghi got away ahead, albeit carrying a foul . . . The real story was written early in the first leg. Higher and faster works . . . Enough review. Tomorrow we race, perhaps, and if we race it’s a 39-mile triangle which should present fewer challenges to the race commitee and, if anything, fewer challenges to the faster boat. We know who we think that is, at match point. I’ve been in Valencia more than a week and haven’t been off the reservation yet. Unless it starts raining in torrents, I’m off to see some Calatrava construction, new since my last visit, and perhaps I’ll drop into a few haunts in the old city. What could possibly go wrong?